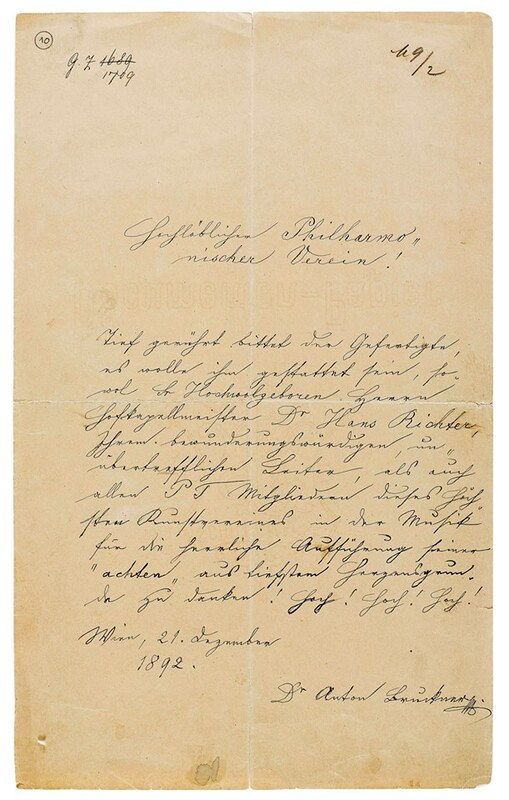 This is the letter of thanks that Anton Bruckner wrote in 1892 to the Vienna Philharmonic in thanks for their highly-successful and well-received premiere performance of his Eighth Symphony under Hans Richter. Note the beautiful and controlled script in a combination of Kurrentschrift and Latein. This was at the time of composition of the scherzo of the Ninth. He had four more years to live, and in that time his hand became more shaky, but it is always easy to read. The transcription and translation are due to me, with substantial assistance from a German friend. grunde zu danken! Hoch! Hoch! Hoch! Deeply moved, the undersigned begs that he may be allowed, both eminent Mr. Court Music Director Dr. Hans Richter his admirable unsurpassable leader, as well as all P T [fully titled] members of this supreme artistic society of music, for the lordly performance of his “Eighth”, to thank from the most profound depths of the heart. Cheers! Cheers! Cheers!